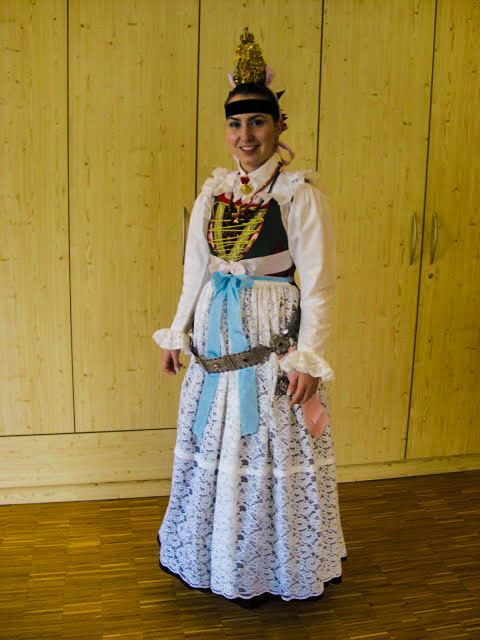 Isabelle Prinoth (above), author of this essay in traditional costume with her hometown of Val Gardena in the background. When I first came to Paris I was not really surprised by the fact that most of the people, even Italians, did not know about the ancient language still spoken in the very North of Italy. Namely Ladin. But later on, when I studied the French geographers Vidal De La Blache and Martonne , I understood that there may be geopolitical reasons for the lack of knowledge about my native language. Although often criticized today, Vidal De La Blache especially, and in general the French school of geography until the 1950s, believed that cultures and languages are defined by the natural obstacles that surround them. This was a theory developed for ideological reasons, mainly to counter the German geographic school, particularly its representative Ratzel and later Haushofer, whose theories about of the dynamic borders and about the "organic state" claimed that a healthy population, like a living organism, naturally expands its borders, had gained popularity in German circles favorable to expansionist policies and colonization. The French theory of natural borders, although just as determinist, was an alternative view. The case of my mother tongue may present such an example of natural borders maintaining, at least partially, a culture in isolation and consequently protecting it against numerous outside cultural hegemonies and favoring its very original evolution . For over two millennia, the Ladin language remained almost unchanged despite German invasions of the Alps during the Middle Ages and the 1918 annexation of my valley by Italy. But there is an alternative to both the early 20th century French and German geographic schools. One of the first to propose an alternative representation was Jacques Ancel. According to this little-known author of Géographie des frontières, natural obstacles are the challenge that force people to seek contact with others from whom they were isolated. Natural obstacles mean natural funnels that bring otherwise isolated populations into the same passages, the same breaches in the natural walls as they attempt to circulate. What can be noticed is that the language did not adapt to the new realities while the culture and traditions were influenced by the German and Italian lifestyle. In order to investigate how the French theory of natural borders can in some cases define a culture and a language, I would like to start by giving a brief idea of the geomorphology of my valley. Looking at the geographical map of Val Gardena you will soon notice that the territory is highly mountainous. It is therefore not a case if my valley has been for a long time inaccessible. As a matter of fact, until well into the 20th century when the first train line was built, the only way to access the Ladin villages was... by foot! Right: Val Gardena. Spectacular views brought to us by UNESCO (below) show how the valleys of the Dolomites (left) can be isolated (comments are in German). Access to the valley is a tunnel dug in the rocks. Moreover, the road is limited on one side by rocks and on the other by a river. It is only when we reach Pontives (30km from Bolzano) that the valley opens up. It is thanks to the geomorphological profile of my valley that it has been for almost two thousand years uninteresting place from the point of view of geostrategy. As a consequence of the closure of the territory the Ladin language has been maintained without any other major linguistic influence. As shown in the photo on the left, the access to the valley is a tunnel dug in the rocks. Moreover, we see that the road is limited on one side by rocks and on the other by a river. It is only when we reach Pontives (30km from Bolzano) that the valley opens up. It is thanks to the geomorphological profile of my valley that it has been for almost 2.000 an uninteresting geostrategic place. As a consequence of the closure of the territory the Ladin language has been maintained without any other major linguistic influence. The access to the valley is a tunnel dug in the rocks. Moreover, we see that the road is limited on one side by rocks and on the other by a river. It is only when we reach Pontives (30km from Bolzano) that the valley opens up. It is thanks to the geomorphological profile of my valley that it has been for almost 2.000 an uninteresting geostrategic place. As a consequence of the closure of the territory the Ladin language has been maintained without any other major linguistic influence. The impressive ridges surounding Val Gardena (below), acted for centuries as natural barriers. On the other hand, as notes author Isabelle Prinoth about her people the Ladins, populations will always find ways to overcome obstacles presented by physical geography to communicate with other groups. A great mixture of influences from several countries are evidenced by the architectural features of the town such as the baroque frontage of the church or its onion-shaped dome, an element surmounting religious buildings throughout Europe from Provence in France to Russia as in many places in Central Europe. This means that the language that is still spoken nowadays in the valley resembles truly to the one spoken in 15 B.C. when the Roman leader Druso conquered the Raetia territory. The Ladin language is therefore a mix of Vulgar Latin and the local language, Raetic. During the Roman Empire the extension of the Ladin was notable, as matter of fact the language was not only present in Italy but in Austria and Switzerland too. It was although with the German invasions during the Middle Ages that the areas where people spoke Ladin became less and less because most of the local people adopted the German language. The language of the invaders coming from the North never influenced the local language in the Ladin valleys, precisely because they were not able to access the valleys. It is in this way that still today you will find people, like me, speaking a really ancient language as mother tongue. Consequently, natural obstacles do determine the language of a given territory. Left: Val Gardena in the winter. 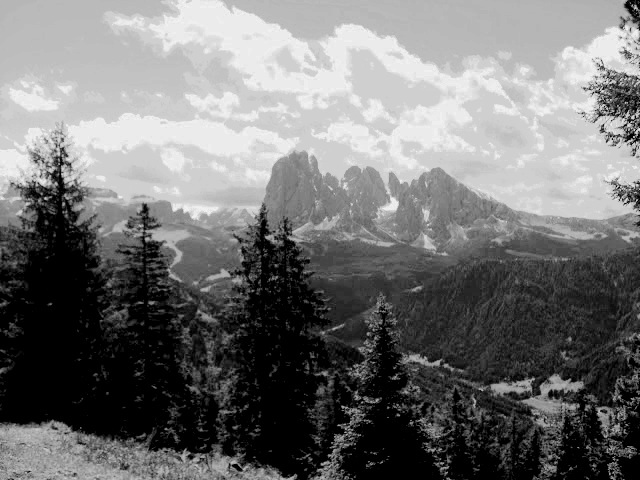 Reaching high altitudes, the Dolomites not only create a wall around the Valley which is a major obstacle for communication between populations. Their climate and its heavy snowfalls that may last from fall to spring adds to the difficulty of transportation. Such natural obstacles as the wall of mountains protected Val Gardena from outside agression and favored the development of a very original language and local culture presents a case that tends to vindicate the late 19th century theory formulated by the founders of French geographic university research according of natural borders. If on one hand the geomorphology of my valley has prevented the Ladin language to change, I must say that especially nowadays there is a strong will of the local people to preserve and promote their language. I recently came across a study that states that my mother tongue will die out in 50 years. I had a long discussion with the representatives of that study because I did not agree. If their research was based on information they could get in books and online, they had never been in the Ladin valley to get some more precise details and information. According to them Ladin would not survive for a long time because it would be overwhelmed by the Italian language. Although roads and automobiles may have changed the life of the valley, climatic conditions in high altitudes remain a major obstacle to easy communication with the outside world, other than by virtual means. Telephones, internet and other means of virtual communication may also be disrupted when environmental conditions become extreme. I on the contrary reminded them that the language had now existed for more than 2.000 years and that consequently there would be no threat. What strengthen my argument is that there is a strong awareness of the Ladins to preserve the language. Most of you probably would not have thought this but there is actually Ladin television and radio and not at least the language is taught as a mandatory subject in school for 8 years. Saying that the language will soon disappear is a big mistake because every Ladin person I have talked to is proud of its language, its roots and its culture and therefore wants the language to be alive for their grandchildren too. As in many remote and isolated parts of the world, traditional non-mechanized farming is still widely practiced. Seen until recently as a sign of backwardness, the know-how of farmers in Val Gardena as in other isolated rural areas of Europe now have a potential to serve as a model of sustainable development. Trains and roads would also make it possible for people from the outside to discover this valley that had been almost unknown. This was the beginning of what will become progressively the most important source of income: tourism. Until 1918 the North of Italy was under Austria and then was annexed to Italy from one day to another by the Versailles Treaty signed in Paris. I remember my grandmother telling me a really interesting thing: “ When I was a little girl, Italian was the language you would learn in school besides Ladin. Then when World War II started we were occupied by German troops again. If on Monday I would say ‘Buongiorno!’ the next day I had to greet the teacher saying ’Heil Hitler!’. The German invasions and the fact that since 1918 we were part of Italy explained why Ladins had the option to choose if we would want to stay in Italy and adapt completely or leave and go to Germany.” It was thanks to this duality that Ladins soon learned to co-exist with more than one language and adapt if the circumstances requested it. What surely has marked the Ladins is the fact that being obliged to adapt once to one reality than to another and it is in this way that people have learnt their predisposition to both languages: Italian and German. This predisposition showed to be successful especially during the 60s when tourism started to be the main income for my valley. Tourists coming from Italy, Austria or Germany, met people in Val Gardena that spoke their language. Until now, the Ladins of Val Gardena are used to study four languages since they start going to school (Ladin, Italian, German and English). This privilege shows to be of enormous importance as it not only improves the apprehensive process of other languages but it also knocks down all the prejudices that on the contrary are still present in Bolzano between Italians and Germans. Differently from the other people in South Tyrol, we grow up learning that there is not a more important language but all belong to our identity; we learn since children to respect and appreciate diversity. In this way we learn that even if there are natural obstacles that prevent people to communicate and determine different aspects of their lives there will be always similarities between the different ethnics exactly because they live in similar circumstances. Coming to the American University of Paris and being in contact with people from all over the world gave me the chance to investigate more precisely my roots and I soon realized that I do not have one culture. I have a mixed culture. What I mean with this is that most of the Ladin people tend to precise that their mother tongue is Ladin while when it comes to define their habits and culture they either choose Italian. German or both. For example, people in the Ladin valley are more likely to eat early, like in Germany, rather than follow the Italian way. On the contrary when we speak about the behavior, Ladins tend to be welcoming and open like Italians. It is not a coincidence if my valley presents this duality when it comes to the culture. The reason for the division is due to the historical background of this territory. According to the French school of geographers, natural obstacles isolate people and create in that way different languages and different cultures. On the other hand it is true that even if there are obstacles people will always find ways to overcome those difficulties and get in touch with other groups. Finally, in the case of my mother tongue, natural borders were of relevant importance as they preserved the language from dying or changing. And it is thanks to the geomorphology of my valley that, today, I can say that although I used to live in Italy, my mother tongue is neither Italian nor German. I am Ladin. Also of great importance: The office for Ladin language planning, (SPELL - Servisc de Planificazion y Eleborazion dl Lingaz Ladin), a local organization, in partnership with the universities of Innsbruck and Zürich, engaged in developing a common writing language for the whole community of Dolomite Ladins. Also in this Issue 1, N&C's reporters take you to sea to face the extreme dangers of modern piracy, to the far North to understand Arctic geopolitics, and to the zoos of the world targeted by political controversy. Don't miss the visual poem on Africa, the debate about overpopulation, our book review and the N&C e-library, a portal to numerous resources on nature and human geography.